Serology is often used for the diagnosis of Mycoplasma pneumoniae. It is important to identify specific antigens that can distinguish between the presence or absence of antibodies against M. pneumoniae. The two proteins, P116 and P1, are found to be immunogenic. By using these in ELISA it is possible to identify an immune response against M. pneumoniae in serum samples. A recombinant protein derived from the P116 protein and one from the P1 protein were used in two ELISA tests, rP116-ELISA and rP1-ELISA. Human serum samples from patients with atypical pneumonia were tested and compared to the results of the complement fixation test. There was a good agreement between the two tests but the rP1-ELISA showed the best discrimination between positive and negative samples. Two ELISA tests based on recombinant proteins have been analysed and compared to the complement fixation test results. The two ELISA tests were found suitable for use in serodiagnostics of M. pneumoniae infections. The use of specific antigens eliminates the risk of cross reaction to an immune response against other bacteria. Mycoplasma pneumoniae is a human pathogen that colonizes the mucosal surfaces of the respiratory tract . The pathogen infects the upper and the lower respiratory tract and is the leading cause of atypical pneumonia in children and young adults . M. pneumoniae infections are often seen as epidemics occurring at intervals of 4–7 years. The patients show flu-like symptoms but characteristically the infection is chronic in onset and recovery . The lacking cell wall distinguishes Mollicutes from other eubacteria and due to the lack of cell wall M. pneumoniae is resistant to penicillin. A specific and early diagnosis is therefore important in order to select the right treatment. The standard methods for diagnosis of M. pneumoniae are culturing, serology and PCR. Since M. pneumoniae can be difficult to isolate  most of the laboratory diagnoses are serology tests, such as complement fixation test (CF test) and different enzyme-linked immunoabsorbent assays (ELISA) . PCR has also been used for the detection of M. pneumoniae [6–8]. The CF test has a limited value producing inconclusive results, because it also measures antibodies deriving from earlier infections , and the glycolipid antigen which is not M. pneumoniae specific cross reacts with antigens of different origin such as other microorganism and body tissues [10–12]. Since serology often is used for the diagnosis of M. pneumoniae infections, it is important to identify specific antigens, which can distinguish between previous and current infection and determine the presence or absence of antibodies. Such antigens can then be used in ELISA with either IgM, IgG or IgA. Investigations have shown that young people tend to have a higher level of IgM antibodies in acute infections, while adults often lack the formation of IgM [9, 13]. Two proteins, the P1 protein and a 116 kDa protein have been characterized as immunogenic [14, 15]. These proteins were used in serodiagnostic ELISA tests, the P1 protein as enriched antigen or in ether-extracted antigen preparations  and the P116 protein as a recombinant protein . In the present study these antigens were tested individually by ELISA on parallel serum samples from patients with atypical pneumonia. The CF test is often used as the gold standard when testing blood samples for M. pneumoniae antibodies. The CF test was used to test 125 patients which all suffered from lower respiratory disease and/or pneumonia. The test results showed that 55 of the 125 (44%) patients were seropositive and 70 were seronegative. All the positive patients showed a fourfold titer rise or a titer of 128 or higher. Blood samples from seven of the 125 patients were selected based on the CF results for Western blotting with whole cell proteins. Five of these were positive in the CF test (nos. 1, 2, 4, 5 and 6) and two were negative (nos. 3 and 7). Three blood samples were obtained from each of the patients. The human serum samples were investigated for IgM, IgA and IgG antibodies to M. pneumoniae (Figure 1A,1B,1C). In immunoblotting a patient was considered as positive if an increase in band intensity between serum samples was observed and negative if either no bands were visible or the bands were equally stained with all three serum samples. With IgM a positive reaction was seen with a 170 kDa protein in two of the CF test positive samples (nos. 4 and 6). IgA positive reaction was seen with the 170 kDa protein with all of the five CF test positive, and two of the CF test positive samples showed a positive reaction with a 116 kDa protein (nos. 5 and 6). The IgG response was the strongest of the responses. The IgG seropositive human sera reacted strongly with the two antigens of 170 kDa and 116 kDa. The immunogenicity and size of the two proteins indicated that these were the P1 protein (170 kDa) [15, 18, 19] and the P116 protein (116 kDa) . 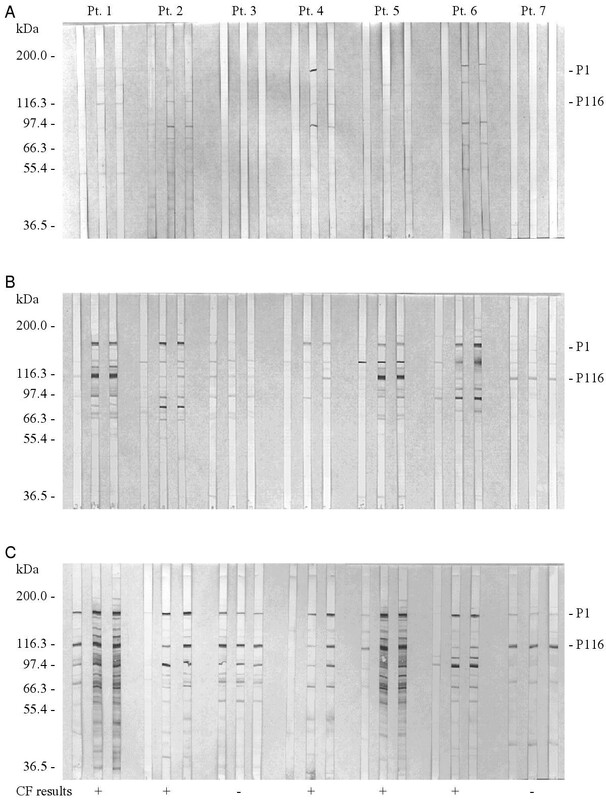 In addition, some of the human sera also reacted with M. pneumoniae proteins of 137, 85, 72, 66, and 55 kDa (Figure 1). With IgG an increase in band intensity of the P1 protein and the P116 protein was observed in all five CF test positive serum samples. The two CF negative patients were also negative in immunoblotting since no change in band intensity was seen. The presence of IgG antibodies in the negative samples might be due to a prior infection with M. pneumoniae. Several groups have shown that the most immunogenic proteins are the P1 and P116 proteins [14, 15, 18, 19]. This was also found in this study (Figure 1). It was therefore decided to test the 125 atypical pneumonia patient sera with two ELISA tests using the P1 protein and P116 protein as antigens respectively. To determine the frequency of antibodies to rP1 and to quantify the response, the purified recombinant rP1 was used in an automated ELISA called rP1-ELISA. The antigen concentration was optimized to get the best discrimination between positive and negative samples. A concentration of 2 μg/ml gave the best discrimination between the high and low OD values. 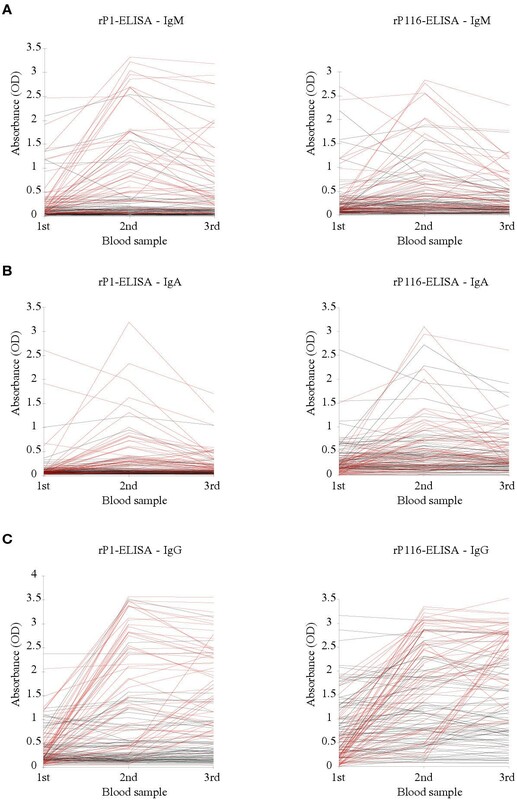 The rP1-ELISA test was used to test the 125 atypical pneumonia patients for both IgM, IgA and IgG antibodies against the P1 protein (Table 1 and Figure 2, CF positive serum samples are shown in red). A patient was considered positive for an M. pneumoniae infection if the OD value changed with more than 0.4. Thirty six (29%) of the individuals had raised IgM antibodies against the P1 protein and 89 (71%) were seronegative. Twenty two (18%) were IgA seropositive and 103 (82%) were seronegative. When looking at the IgG response 57 (46%) were seropositive and 68 (54%) were determined negative. The results are shown in Table 1 and Figure 2. ELISA results obtained with rP116-ELISA and rP1-ELISA. The A) IgM, B) IgA and C) IgG levels are illustrated. The patients tested positive by the CF test are indicated by red color and the CF negative are marked by black. Similarly, the frequency of antibodies to rP116 was quantified. The purified rP116 was used in the rP116-ELISA. Here the optimization of the antigen concentration showed that a concentration of 2.5 μg/ml gave the best discrimination between the high and low OD values. The serum samples were investigated for both IgM, IgA and IgG antibodies against the P116 protein. The rP116-ELISA result is shown in Table 1 and Figure 2. As for the rP1-ELISA a patient was considered positive for an M. pneumoniae infection if a change in OD value with more than OD 0.4 was seen. Thirty two (26%) patients were tested positive for IgM antibodies and 93 (74%) were tested seronegative. When looking at the IgA response 29 (23%) were tested seropositive and 96 (77%) were tested seronegative. Sixty nine (55%) of the patients were IgG seropositive and 56 (45%) were seronegative. Most of the IgM ELISA positive individuals in both ELISA tests had a distinct rise in antibody level between the first blood sample (acute-phase serum) and the second blood sample. Many of the patients' IgM antibody level decreased from the second to the third blood sample. This picture was even more prevalent with the IgA positive patients where an increase in antibody response was seen between the acute-phase and the second blood sample and after that the IgA response decreased markedly. 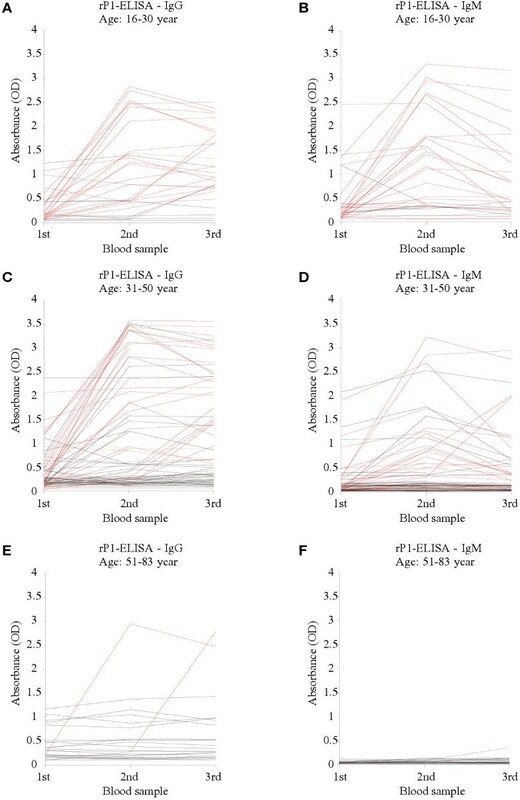 The IgG response of the seropositive patients was different from the IgM and IgA responses since the IgG antibody level kept at a constant level from the second to the third serum sample after increase between the first and second serum sample. In all three tests 49 were found positive, 10 were positive in two tests, 14 were positive in one test and 52 were negative (Table 2). Eleven of the 14 were only positive with the IgG rP116-ELISA, two were only positive by the CF test and one with IgG rP1-ELISA. The patients were divided into three age groups (16–30 years, 31–50 years and 51–83 years). The results showed that a mycoplasma etiology of atypical pneumonia was related to age (Table 3). Of the 125 patients most of those found positive with both IgG and IgM were between 16 and 30 years old. The percentage of positives in this age group was 55% for IgM and 71% for IgG in the rP1-ELISA (Table 3). In comparison no IgM positive samples were found in either of the two ELISA tests in the age group 51–83 and only a few IgG positive samples were found in this group. The same picture was seen in the CF test where 77% were positive in the group 16–30 years and only 8% were positive in the group 51–83 years. Respiratory disease due to M. pneumoniae can be confirmed with serological methods of which the CF test is the most widely used. So far, no commercial ELISA test using recombinant proteins or synthetic peptides of M. pneumoniae proteins has been developed. We compared three different antigens for detecting antibodies against M. pneumoniae, the rP116-ELISA, the rP1-ELISA and the CF test. Of the 125 patients tested, 55 showed a fourfold rise in antibody titer/ high titer, when tested by the CF test. Fiftyone of these were identified as positive with anti-human IgG in rP1-ELISA. Similarly, 52 were tested positive with rP116-ELISA. Of the 70 negative CF test samples six were positive with rP1-ELISA whereas 17 were positive in the rP116-ELISA. When comparing patient serum samples found positive only by one test, the IgG rP116-ELISA showed positive reaction with 11 patients while IgG rP1-ELISA tested one positive and the CF test tested 2 positive (Table 2). Therefore the CF test and the rP1-ELISA showed the best agreement. The CF test measured antibodies to M. pneumoniae glycolipid antigen and can thus react with antigens of different origins [10, 11, 20]. However, this seems not to be a problem in the present study where serum samples from atypical pneumonia patients were tested. The antigen used in the rP116-ELISA and the rP1-ELISA were recombinant proteins, which means that the two tests measured antibodies specific to the P116 or the P1 protein. The advantage of using a purified recombinant protein in serodiagnosis rather than the complex fractions used in the CF test is improved specificity. With the CF test the specific antigens are not known and cross-reactivity has been observed with the closely related Mycoplasma genitalium . However, no reaction to the rP1 and rP116 proteins was observed with an antibody raised against M. genitalium and the rP1 and rP116 proteins . The CF test detects both IgG and IgM antibodies  while the two ELISA tests were designed to detect one of the antibodies. The ELISA tests seems to detect smaller amounts of IgG or IgM and they may therefore be more sensitive. The blood samples were obtained from patients with atypical pneumonia. Earlier investigations have shown that during a M. pneumoniae epidemic 20–38% of patients with respiratory tract infection have a serologically confirmed M. pneumoniae infection . In this study 47% were positive in at least two of the tests. Whether an ELISA test should be based on the IgM, IgA or IgG response depends on the age of the patients. An IgM response can be minimal or undetectable in case of adult reinfection with M. pneumoniae. In addition, the samples should be taken at the right time after infection. It was proposed that an ELISA test based on IgM for children and young adults and a test based on IgG for adults are the best ways to detect M. pneumoniae infections . 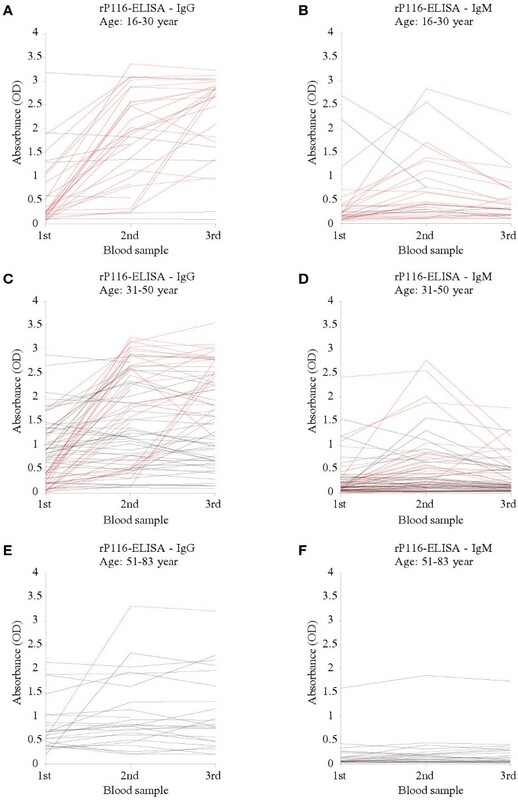 This is confirmed in the present study were younger patients had a higher IgM level while the older patients showed higher IgG levels (Figure 3 and 4). The use of the IgA response did not provide additional information since the number of positive samples was lower than the number found to be IgG and/or IgM positive with the rP1-ELISA and the rP116-ELISA. The antibiotic treatment with doxycycline (a tetracycline) and roxithromycin (a derivate of erythromycin) which was started immediately after the collection of the first blood sample, might be the reason why the IgA OD level was kept in the low range (OD 0–0.4) and why the IgA OD titre was markedly lowered after the second blood sample was collected. Anti-M. pneumoniae IgG remains elevated for at least a year following infection. A high antibody titre in a single serum sample may suggest current infection or persistence after a recent or past infection and thus it is not diagnostic. The ELISA tests are of best value in demonstrating an increase in antibody level  and it is necessary to collect a second and maybe a third blood sample to confirm an acute infection with M. pneumoniae . The detection of both IgM and IgG antibodies and the use of more than one serum sample seem to increase the reliability of diagnosing an M. pneumoniae infection, and use of the rP1-ELISA test with paired sera and with both IgG and IgM seems to be the best choice. The results obtained in the present study indicated that rP116 could be used as a serodiagnostic reagent, but the rP1-ELISA test seems to be the best since it differentiates better between the positive and negative samples (Figure 2). An ELISA test combining the rP1 and rP116 proteins might give a better test because different patients could react more strongly to one antigen than the other. rP1-ELISA results divided into three different age groups. A) Age 16–30 years IgG, B) 16–30 years IgM, C) Age 31–50 years IgG, D) Age 31–50 years IgM, E) Age 51–83 years IgG and F) Age 51–83 years IgM. The patients tested positive by the CF test are indicated by red color and the CF negative are marked by black. rP116-ELISA results divided into three different age groups. A) Age 16–30 years IgG, B) 16–30 years IgM, C) Age 31–50 years IgG, D) Age 31–50 years IgM, E) Age 51–83 years IgG and F) Age 51–83 years IgM. The patients tested positive by the CF test are indicated by red color and the CF negative are marked by black. If a PCR test is used for the detection of M. pneumoniae and the results turned out to be negative, serology with a test as rP1-ELISA could be used to decide if a patient is infected by M. pneumoniae or not. Using a specific test for measuring antibodies against M. pneumoniae is relevant because otherwise it can be difficult to obtain a correct diagnosis of atypical pneumonia. It is essential to be able to diagnose a M. pneumoniae infection fast and reliably to give the patient the correct treatment. An early diagnosis can also warn the medical community of an impending epidemic of M. pneumoniae pneumonia. In conclusion the present study showed that the three tests used can detect antibodies against M. pneumoniae in patients with atypical pneumoniae. Two of the tests were based on recombinant proteins, they were both found suitable for use in serodiagnostics of M. pneumoniae infection, although the rP1-ELISA test and the CF test showed the best agreement. An advantage of using specific antigens is that it eliminates the risk of cross reaction to an immune response against other bacteria. Acute and convalescent-phase sera were collected from patients with atypical pneumonia in Malmø, Sweden in the period from 1990–93. Two or three blood samples were obtained from each of the 125 patients, which all suffered from lower respiratory disease and/or pneumonia. The first blood sample was collected in the acute phase of the disease. The second and third serum samples were obtained 14 and 28 days later. The serum samples were obtained during a suspected outbreak of respiratory infections caused by M. pneumoniae. The age range of the patients was from 16 to 83 years. The blood samples were tested for M. pneumoniae by the use of a complement fixation test. M. pneumoniae FH (ATCC, MD, USA) was cultured in 100 ml SP-4 medium  in TPP tissue culture flasks (MediCult, Copenhagen, Denmark) and incubated at 37°C for 48 h. An exponential growth phase was indicated by a color change of the medium from red to orange. The plastic adherent cells were scraped off into phosphate-buffered saline (PBS) and centrifuged at 10,000 × g for 30 min. The cells were washed in 5 ml PBS and centrifuged at 20,000 × g for 15 min. The pellets were stored at -70°C. Most of the P116 gene was cloned and used for the production of a recombinant protein called rP116. The recombinant protein was produced as described previously . A recombinant protein covering a part of the C-terminal part of the P1 protein called rP1 was supplied by medac, Germany. The two recombinant proteins were used in the two ELISA tests. Proteins (100 μg) of M. pneumoniae whole cells were dissolved in 150 μl SDS sample buffer (62,5 mM, 10% v/v glycerol, 2.3% v/w SDS, 5% v/v β-mercaptoethanol, 0.05% w/v bromphenol blue), boiled for two min. and separated by SDS-polyacrylamide gel electrophoresis (SDS-PAGE) using 10% SDS-polyacrylamide gels with 5% stacking gel. The gels were transferred to nitrocellulose membranes (Schleicher & Schull, Dassel, Germany) by electroblotting. The membrane was blocked for 15 min. at 37°C with blocking buffer (20 mM Tris-base, 150 mM NaCl, 3% gelatine) except for the molecular weight marker, which was cut from the membrane and stained with Amido Schwartz. The membrane was cut into 3 mm strips and these were incubated with human serum samples diluted 1:200 in antibody buffer (20 mM Tris-base, 150 mM NaCl, 3% gelatine, 0.05% Tween-20) for 1 h at 37°C. Bound IgG was detected with Alkaline phosphatase (AP)-conjugated goat-antihuman-AP diluted 1:3000. The strips were developed for 10 min. with a nitroblue tetrazolium (NBT) and 5-bromo-4-chloro-3-indolyl phosphate p-toluidium (BCIP) solution. The 96 wells maxisorp microtitre ELISA plates (Nunc, Roskilde, Denmark) were coated with 60 μl per well in duplicate of the rP116 (2.5 μg/ml) or rP1 (2.0 μg/ ml) in Carbonate-Coating-Buffer (0.1 M Na2CO3, 15 mM NaN3)). The plates were incubated over night at 4°C and blocked in 75 μl blocking buffer (15% fetal calf serum in PBS with 0.02% SodiumAzid) at 37°C for 1 h. After washing with PBS + 0.05% Tween-20, 50 μl human sera samples diluted 1:50 was added to the plates and incubated at 37°C for 1 h. The plates were washed and then incubated with 50 μl of peroxidase conjugated antihuman IgG, IgA or IgM at 37°C for 1 h. After the last wash the plates were developed with 50 μl TMB (tetramethylbenzidine) substrate (medac, Hamburg, Germany) for 30 min. at 37°C. The reaction was stopped by adding 100 μl of 1 M HCl. The plates were read by photometric reading at 450 nm on a Sunrise reader (TECAN, Austria GmbH). A sample was considered as positive if the antibody titre increased or decreased with more than 0.4 in absorbence (OD value). The CF test was performed by standard procedures as an in-house method. The antigen for this test was supplied by The National Bacteriological Laboratory in Stockholm. A fourfold titer rise or a titer of 128 or higher was considered to be evidence of actual infection. MD carried out the ELISA tests and drafted the manuscript. PN did the immunoblots. KP collected the human serum samples and provided the CF test data. MD, SB and GC took part in the planning of the study and editing of the manuscript.